These beautifully crafted receptacles make a natural fit for TWG Tea's fine teas; and also add vibrant jolts of colour to any room. You see them at TWG Tea salons and boutiques all around the world—brightly coloured tea tins decorated with eye-catching designs that give the luxury tea brand’s retail spaces the feel of an Old World emporium. Since 2008, the Singapore-based brand has worked closely with French artist RAM Aron to elevate the humble tea tin into the realm of art. Aron’s vision is fully expressed through the hand-painted tea tins. His inspiration begins, naturally, with a cup of tea—the taste and aroma of TWG Tea’s most beloved fine harvests teas and blends form the cornerstone of his conceptualisation for each tin design. The visuals also bring tea lovers through the changing seasons and hitatler_tatler_stories of teas from all over the world. 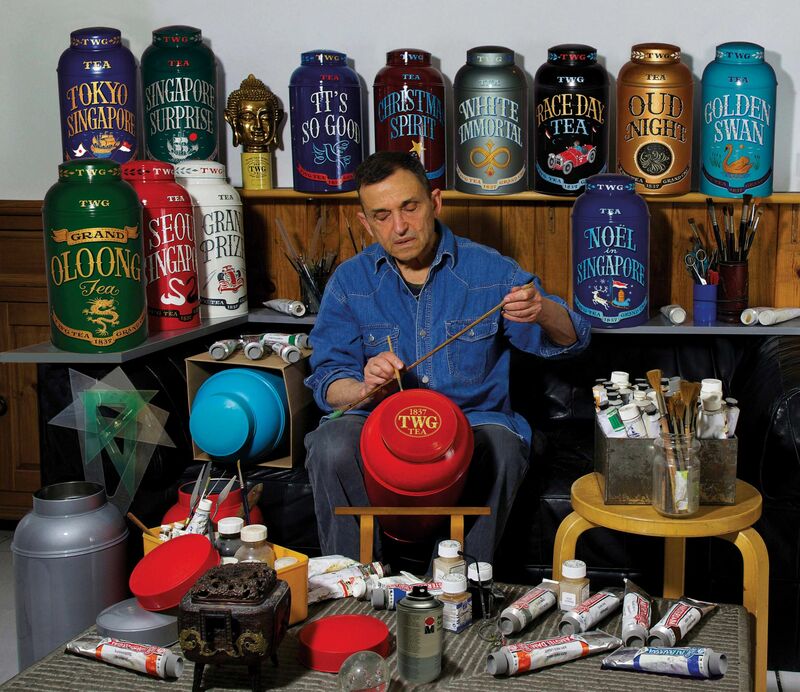 Each hand-painted tea tin requires 36 hours of craftsmanship to create and each is signed by the artist. Those who like their tea tins to be vivid reminders of their favourite blends will enjoy how the French Earl Grey Collector’s Tea Tin matches the colour of the French blue cornflowers in the tea. The green tint of the Moroccan Mint tin is reminiscent of the Saharan mint included in this particular blend, while the mellow yellow of the Pure Chamomile tin echoes the colour of the chamomile flower’s pistils. Other tins use colour to evoke a mood, or a sense of place—the cheerful red of the English Breakfast tin, for example, calls to mind the iconographic reds of English telephone booths, double‑decker buses and palace guard uniforms. Each Collector’s Tea Tin is a reproduction of the artist’s original work and can hold up to 1kg of loose tea leaves and are perfect for storing your favourite leaves away from light, air and humidity. For those who want to get a little more creative, these stylish tins can also easily double as decorative accents in homes and kitchens. Atelier Special: Slip behind the scenes with us as we take you into the wonderful—and often private—world of ateliers. In Part Two of a series of four, we show you a glimpse of what goes into creating TWG teas tins.